Parks, gardens, tree-lined streets, balconies, atria, glasshouses, allotments, bird feeders, green walls, nature reserves, aviaries, zoos: these are amongst the most obvious ways that planners, designers and citizens bring nature into the city. But something similar happens via certain marginal urban practices, that by their very nature construct and re-construct the city as wilderness, bringing the values of the untamed outdoors into the urban asphalt, concrete, brick and stone “jungle.” Such is one of the claims of urban spatial practices such as parkour (see previous post) and its relatives. On the face of it, free running, buildering, rooftopping and the like treat walls, roofs, parapets, street furniture, ledges, railings and structures as though mountains, rocks, caverns, streams, boughs, trunks and other landscape elements to be scaled, jumped over, swung from, jumped off, balanced on and vaulted. Cultural studies theorist Michael Atkinson traces the history of parkour to its foundation in training for jungle combat, and the idea of the obstacle course, as developed by French Vietnam veteran George Hébert (1875-1957) — a deeply respectful pursuit of fitness training in the outdoors. In the absence of balance beams, ladders, rope swings, and organised obstacles suburban fitness enthusiasts resorted to the materials at hand. This was the approach of the founders of the modern parkour movement, Raymond Belle and David Belle. The practice seems to have inherited Hébert’s passion for nature. For the Belle family, “their use of concrete and steel city spaces jibed well with Hébert’s philosophy of immersing oneself in one’s immediate physical/natural environment to gain a deep phenomenological awareness of it” (4). Atkinson identified the persistence of this positive orientation to nature in his study of contemporary traceurs (parkour practitioners). There’s an element of the radical flaneur (as expounded by Walter Benjamin) in the traceur. There’s also an ideology in play, of challenging the status quo, the impersonality of the city, its restrictions and exclusionary zonings, inequalities, commodification of life and environment, and pernicious promotion of capitalism. In keeping with this legacy, parkour eschews organisation, and offers itself as an uncompetitive sport, or postsport, “one that subverts modernist ideologies and practices outright and is one in which corporeal dichotomies between the sacred and profane, the raw and the cooked, the civilized/socialized and the primordial body are challenged through athletic movement … Postsports are at once moral, reflexive, community-oriented, green, spiritual, anarchic, and potentially eros-filled physical cultural practices” (11). I think the clue to the potency of such marginal urban practices resides in their ability to render strange the all too familiar environment of the city. According to Atkinson, “urban traceurs argue that their movements in the city only appear as strange because the ‘natural’ environment of their city is, in itself, strange” (16). Here Atkinson appeals to Heidegger’s concept of poiesis. He says, parkour “brings forth and reveals, through its obvious strangeness there, the fundamentally dominated nature of city life by late modern ideological codes and practices” (17). Parkour claims a space amongst other physical and meditative practices by which adherents move into the zone, and enter the flow: “Temporarily losing the desire to rationally control one’s self, honing flow through Parkour, and developing a sense of connection with the urban landscape is articulated as something purely aesthetic” (23). There is indeed something strange going on here. Parkour and other modes of street practice are distinctly urban. They reflect urban problems, and offer responses that enlist the tools and elements of the urban environment. They offer no plan for retreat to the woods, plant gardens or in other ways remedy the conflict between nature and the city. And yet these marginal urban practices (parkour, etc) present as products of nature, born of a love of the woods. Such practices seem to hark back to our primitive place in the wilderness, and to try and recapture it by distinctly urban means — using the language of the city. Greening the city, building garden bridges over the Thames, and other worthy “bourgeois” initiatives don’t have a monopoly over nature in the city. There are other responses. Marshall McLuhan wrote a great deal about tribes in the electronic age, e.g. “the return to Nature and the return to the tribe are under electric conditions, fatally simple” (155). The first image is of an urban rabbit in Berlin, 2014. 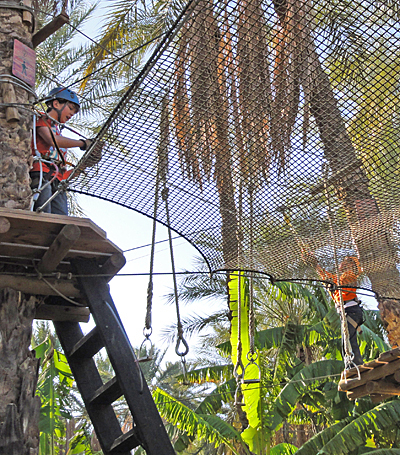 The second photograph is of a leisure tree-top obstacle course in Tozeur, Tunisia. 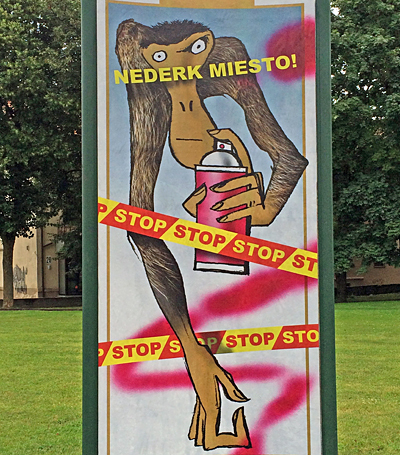 The last image looks like an anti-graffiti poster in Kaunas, Lithuania, though I think it’s an ad for a street art festival. Page numbers for Michael Atkinson’s article are from a preprint, also online.